I’ve always enjoyed reading up on survival skills, even as a kid I would pour through my Dad’s army survival manuals. 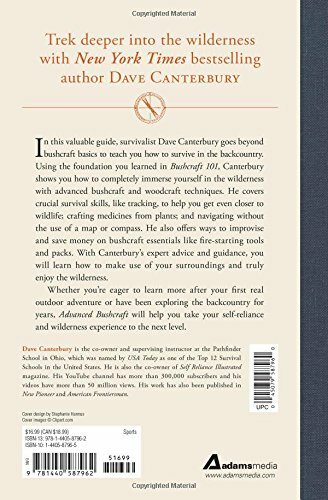 So when this new book by Dave Canterbury came out, I was pretty jazzed. I enjoyed reading his first book, Bush Craft 101 and was excited to see a more advanced manual for long term survival in the bush. Dave Canterbury is the co-owner and supervising instructor at the Pathfinder School in Ohio, named as one of the top twelve survival schools in the United States by USA Today. He also has a great YouTube channel if you’d like to check it out. Dave’s first book concentrated on beginners who want to prepare for shorter camping, hiking, and hunting trips into the wild country. This guide is geared toward those who have the basics under their belt and want to prepare for longer trips into the woods. On those short trips you can carry enough food and gear to get by for a week or two, with only a need for supplemental materials. For the advanced wilderness survival trip, you won’t be able to bring enough supplies to last the duration, so Dave goes into a much more detailed list of what to bring and how to find the food and materials you’ll need. So what can you expect to learn from this advanced manual? Dave also has a section of tips and tricks at the end of each chapter to give you more in depth information. I like the fact that this guide is written by someone who actually uses the techniques and practices on a regular basis, refining his skills and sharing valuable information for anyone interested. Dave writes in a no nonsense style that is easy to read and comprehend. You’ll have trouble putting it down! This book is great to read from the comfort of your armchair in the dead of winter, or to pack up with your gear and take along with you on a trip into the wilderness. I highly recommend studying this book before you head out into the woods for any length of time. Practice the skills at home to make sure you’ve got the hang of it, and then start planning your wilderness treks! Disclaimer: I received a free copy of this book to review on my blog. I do not make any money off the sale of this book. All opinions are my own.